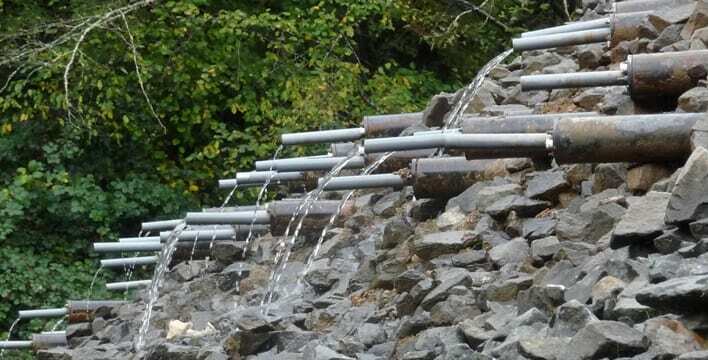 Launched Horizontal Drains allow for pore water pressure relief during transient high groundwater events and provide a tensile and shear contribution at the same time. Traditional drilled drains provide no tensile contribution and are often spaced in a single row between 10 and 30 feet on center. Launched Horizontal Drains can be installed rapidly (up to 200 drains per shift) and are spaced in multiple rows as densely as 2.5 feet on center. Landslide repair practitioners never have had the luxury of such a tightly spaced array of horizontal drains, and no system currently available today provides for both tensile and shear capacity in addition to drainage.